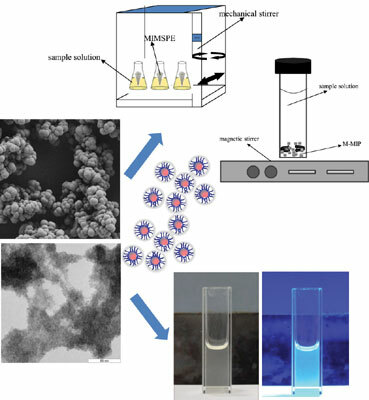 Background: This review describes the use of molecularly imprinted polymers (MIPs) as tailor-made adsorbents for developing micro-solid phase extraction (µ-SPE) procedures when isolating/ assessing organic pollutants, drugs, and bioactive compounds from environmental, food, and clinical/ forensic samples. Objective: Developments in MIP-µ-SPE are focused on synthesizing selective MIPs before preparing micro devices, and also when synthesizing MIPs onto nanoparticles such as magnetite (magnetic MIPs). Conclusion: The current paper also reviews advances in MIPs synthesis onto quantum dots (MIP-QDs) for fluorescenssce sensing of organic compounds, advantages and drawbacks of each methodology, and future expected trends. Molecularly imprinted polymers (MIPs), micro-solid-phase, extraction, probe sensing, micro devices, quantum dots (MIP-QDs).